Oy, it has been a rough few days! I am currently typing this update on a computer in one of the labs at school because I spilled a glass of water on my laptop on Thursday (it is now Tuesday) and I still haven't gotten it back from the repair shop! I'm pretty stressed out about this, especially since the guys at the repair shop keep telling me they're going to call me with an update, and then they don't, and then I call them and get told the same thing. When I talked to them last night they said it might be ready today, fingers crossed! I've fallen majorly behind on work now, and will probably be writing instead of sewing over reading week (next week) as I had planned. I feel rather disgruntled and down about all this, but I'm hoping it will get worked out soon! Okay, enough of my complaining, on to other things! I completely forgot to share a little project I made the previous weekend in my last post, so here we go! My Mum got Alex a GPS for Christmas, but it didn't come with any sort of case or anything to put it in when taken out of the dash-mount, so I decided to make one. I basically just made a little pouch with quilt batting between the two layers of fabric to give it a little padding, and used an elastic hairband for the closure. 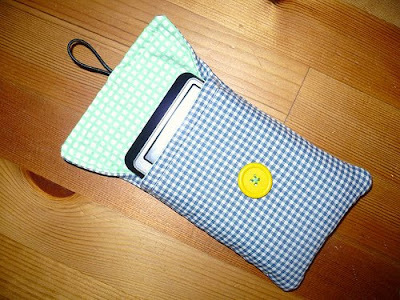 I'm kinda proud of myself for this one...I know this is going to sound a little odd since I've made quilts, purses, stuffed animals, etc, but I've never made a pouch of any kind for anything before, and I did this without a pattern, and the GPS fits perfectly! Who knew I'd be more proud of myself for this little pouch then for a lot of other things I've made. I definitely had a few problems along the way (mostly because I basically winged it), but it turned out good and it serves its purpose. On Sunday, while watching the Super Bowl, I decided to finally tackle on of the projects in Rashida's books I Love Patchwork which I mentioned a few posts back. One of the reasons why I bought the books, other than the fact that Rashida is so awesome, sweet, and nice of course, was that I wanted to make the Blossom Pincushion, which is one of the items that Rashida is known for (she still makes them and sells them in her shop). I picked up the porcelain watercolour palette at Midoco, an arts and office supply store here in Toronto and used some Moda linen, and patterned cottons. I can't remember what collection the pink plaid cotton is from, but the other four are all from the Aunt Grace Classics collection from Marcus Fabrics and I love them because of their vintage flea market/granny feel! I realized after I finished this that if I had stuffed each pincushion a bit more, they probably would have come out a but rounder...oh well, that's what I'll do the next time! I still love it though, and think it's so sweet and fun! I'm going to have a great time using it for sure! Alright, that's it for me today! I have to go and do work that I've actually already done, but have to do again since it's on my laptop! Hope everyone is having a wonderful week so far, and that the weather in your area isn't causing too many problems. We have nothing here in Toronto, although it is supposed to snow a bit tonight, but I know some people are having some crazy times (the metre of snow that Jennifer already has can attest). Stay warm everyone! UGH. Sorry about the computer. That's maddening! I love your little pouch. We gave my father-in-law a GPS for Christmas. I wish I'd made him a little pouch to go with it! Love the little pincushion too. I need one! Awwww that pouch is awesome! I am sure he loved it. And how cute is that pin-cushion??!! HOw frustrating about the computer dude. What a pain. I went a week without my computer and it dragged like months! is your water color palette glass or plastic? i'm looking for a glass one so it is weighted down pretty good but can't find one. one of our local art supply stores just closed down. it's sad because i was just a bike ride away from it. POUT. hang in there with the machine woes. it's good to see you posting when time allows and wherever you can. I can't believe it, my sister has one of those porcelain palettes used for watercolor (in her case, beads)! 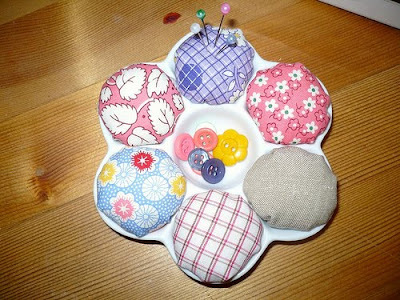 I have to ask her where she found it so I can make this so-pretty pincushion.